MADRID.- Starting yesterday, until the autumn of next year when it is envisaged that work will be completed on the Museo del Greco in Toledo, visitors to the Prado will have the chance to appreciate the artist’s unique work, View and Plan of Toledo. 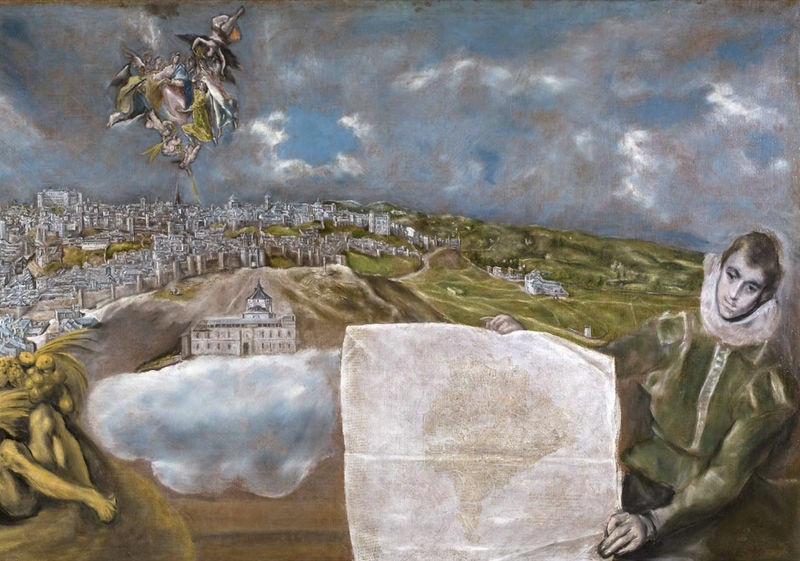 In contrast to the partial views of the city that appear in other works by the artist, this canvas offers a multiple viewpoint; in addition to a perspectival presentation it includes a detailed plan of the city, held up by the figure of a young man and painted with the characteristically sketchy handling of the artist’s last years. This complex composition also includes an allegory of the river Tagus, seen here as a sculpture that pours water and hence prosperity, as well as the iconic religious image of that city, that of the Virgin placing the chasuble on Saint Ildefonso. In addition, prominence is also given to the Hospital de Tavera, which is depicted on a cloud in an explicit reference to the administrator of the building, Pedro Salazar de Mendoza, a friend of the artist and the probable patron of the work. 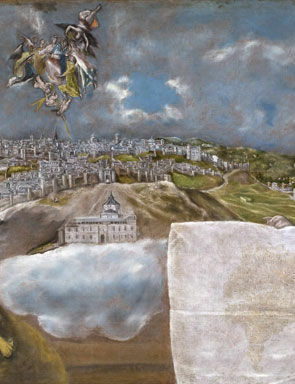 With the aim of highlighting the presence of Toledo in many of El Greco’s most famous paintings, View and Plan of Toledo will be exhibited in room 8A, which will form an additional space to the two permanent galleries devoted to the artist’s work in the Prado. The View and Plan is accompanied by three other works by the artist: Saint Sebastian, Saint Andrew and Saint Francis, and Saint Bernard. The latter belongs to the Prado but has been on long-term deposit with the Museo del Greco (in Toledo) since that museum opened. It has now returned to the Prado while the museum in Toledo is being restored and will return there on completion of work. During the period of their special installation in this room the three paintings will have labels that identify the most famous buildings in Toledo that are depicted in each painting, such as the castle of San Serando, the Alcántara bridge, the Alcázar, the monastery of San Bartolomé and the Montero chapel, all important monuments that can also be seen and identified in the View and Plan of Toledo. The Sub-directorship of State Museums, which depends on the General Office of Fine Arts, took the initiative to send works from the museum in Toledo (which is a State museum) on travelling exhibition while work on the building was carried out. However, the state of preservation and extreme fragility of the View and Plan of Toledo encouraged the decision to bring the work to the Prado for its restoration and subsequent display until it returns to Toledo. The painting was restored by Rafael Alonso of the Museo del Prado, who had previously worked on the canvas. His principal efforts consisted of consolidating the pigment in some specific areas, cleaning the varnish lightly and adjusting the colour balance, all with the aim of maintaining the artist’s highly delicate treatment and handling with its characteristic transparencies in the preparatory layer. Following its restoration, the canvas is now on display at the Prado not just as a “special guest” but also in optimum condition. Crown. toledo and madrid, 1629.